King & King Business Advisors, dba: KKBA, is a nationwide business advisory firm that was formed in 2005. Although we have sold virtually every type of business we do have a speciality practice within that sell medical businesses. Likewise, our Medical Sales Group works with Pharmacy, DME, and Urgent Care Center owners to sell their businesses. Headquartered outside of Washington D,C, in Rockville, Maryland we have developed a national practice and a loyal following. Selling Pharmacy Businesses or DME Business or Urgent Care Center is not a good DIY Project. In spite of the fact that we sometimes make it sound like what we do is easy. You should know that it’s only easy to us because we have done it successfully hundreds of times over the years. Working through all of the details and issues to get a transaction completed is like herding cats. No two business sales are alike and no two sellers are alike. We are all individuals and are businesses are a direct reflection of our individuality. Isn’t that one of the main reasons we start businesses, so we can run them the way we want? My Father’s Words of Wisdom. My Dad was a blue collar guy, a tradesman. He used to always say to me, “Son, You Don’t Know, What You Don’t Know!” These words ring so true when it comes to selling your own business. As a matter of fact the buyers today will almost always have lawyers, CPA’s and MBA’s guiding them. These folks are professional negotiators and their compensated for doing the buyer’s bidding and not yours. Going it alone up against these folks would be like taking a knife to a gun fight. By the same token, there are benefits and concessions you can get if you know to ask for them. This is where we shine, where we bring real measurable value. Above all, our clients always end up better off financially than they would have been had they not engaged us. 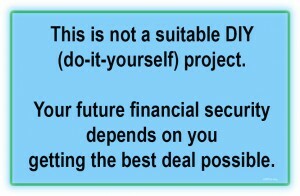 Your future financial security depends on you getting the very best deal possible. We learned from a recent industry survey that many brokers around the country have additional charges and fees. And, some are using Non-Cancellable Listing Contracts that guarantee them a fee whether your business sells or not. First, we do not charge an up-front fee. Second, we do not charge any monthly (on-going advertising) fees. Third, our business relationship with you is solely based upon our performance. If you choose to take your business off the market or go with someone else, you are free to do so without penalty. Fourth, if we are not successful in selling your business YOU PAY US NOTHING! If all of this sounds like it makes sense to you we would love to chat with you. Please feel free to call us too free at 888-565-6468.